Whimsy Wood March Winds And April Showers Bring Forth May Flowers! While the wind is blowing a gale outside and the rain is pitter-pattering down the window pane, I’m trying to remain positive and think about that well known saying above of ‘March winds and April showers bring forth May flowers’! 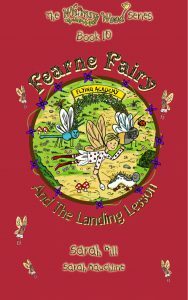 If it all gets a bit much, I might have to adopt Fearne Fairy’s thinking below of ‘If you can’t beat ’em, join ’em’ and go jumping in numerous muddy puddles! 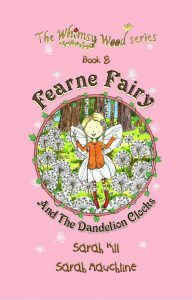 Here’s Fearne Fairy jumping up and down in a muddy puddle in Whimsy Wood! Now what I most like about Spring is the sign of fresh green shoots growing, indicating new life and fresh beginnings, which brings me onto the new Whimsy Wood story that I’m currently writing. I love researching all the woodland flora and fauna that is relevant to the month and book that I am writing for and it amazes me the number of weird and wonderful things we have growing and living in our woodlands! 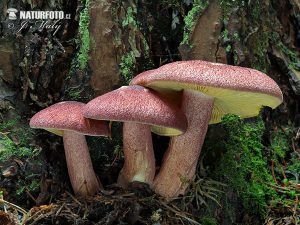 This terrific toadstool below is a prime example! This beauty is named the ‘Plums and Custard’ fungus and rightly so, with its creamy yellow undersurface on its cap and the rest of it being a marvellous maroon colour! You won’t be surprised to learn that I shall be weaving this magnificent mushroom into the latest Whimsy Wood book! 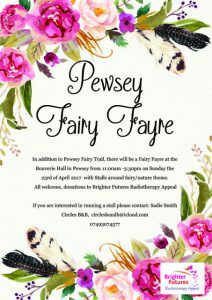 Finally we’re thrilled to have been invited to attend the Pewsey Fairy Fayre in Pewsey, Wiltshire on Sunday April the 23rd! 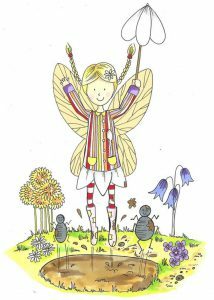 There will be a Fairy Trail as well as the fairy-themed Fayre, so if you fancy a day filled with fun, frivolities and fairies then come along!